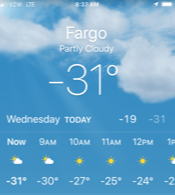 Temperature Wednesday, Jan. 30, 2019, in Fahrenheit in Fargo, N.D. Windchills around -50. We’ll see how that goes over. Meanwhile, here’s a little story. One year back in the early 1980s my family walked through an entire winter without a vehicle. And that winter was a badass, let me tell you. Didn’t get above 0° for six straight weeks. 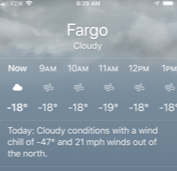 That’s Fahrenheit, not Celsius, where 0° is the freezing point. No, I’m talking 32° below the freezing point of water here. And usually well below that. It was a rotten winter to be going without a car, but that’s what my family was doing. Something happened to our car – I can’t remember what – and my folks couldn’t afford to even buy a used one. That left us on foot. Dad walked about five miles a day, one-way, to his job at the State Hospital in Jamestown, N.D. Mom walked about half a mile to her job as the lunchroom supervisor at a local school, and a few blocks more to the grocery store once a week. I had the shortest walk, only about four blocks, to the junior high school. A few days before Christmas my folks borrowed my grandparents’ fine white Chrysler to take us all shopping. It was bitter cold. Horrendous windchills. Miserable, kind of like the last couple of days. But we went, anyway, because, well, what other choice did we have? Suddenly there were a couple of jolts followed by the screeeeeeech of something metal grinding on something unforgiving. Dad pulled the car over, slammed it into park and got out. He looked down at the front-left area of the vehicle, then started walking slowly around the whole thing. We heard some words that definitely weren’t for young ears, then Dad motioned for Mom to get out. Of course I followed along. 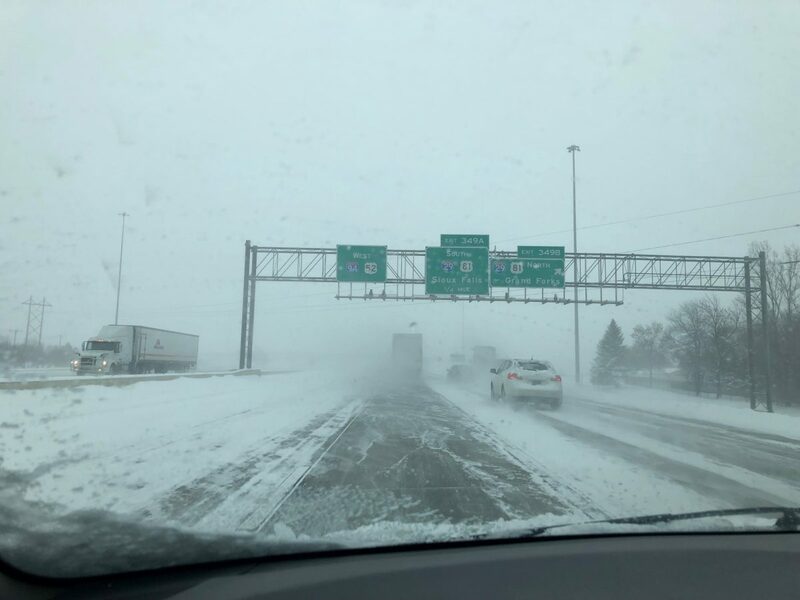 This was Tuesday, Jan. 29, 2019, in Fargo, N.D. Note the windchill. The car’s tires were flat. All four of them. Shredded, actually, with the rims pressing their carcasses into the ice-covered asphalt. It was so cold that the rubber tires froze, cracked and came off in tattered strips. According to the online Urban Dictionary, “’till the wheels fall off” means to keep something going as long as you possibly can, the way you would drive a car until the wheels fall off. It often implies forever, but in most cases means until something comes along to mess things up. That figurative meaning was right on. And on that night, the literal was, too. We drove that Chrysler through the brittle cold ’til the wheels fell off. Speaking of growing up, doing it in the upper Midwest I heard a lot of stories about folks freezing within feet of their doors. Some of the tales came from “The Olden Days,” but others were more recent, relayed by people who actually knew the people who died because they didn’t give Mother Nature and Ol’ Man Winter the respect they deserve. I’ve touched on this before, in a piece called “Blue Skies and North Dakota Slams.” That one was more about how often North Dakota and North Dakotans get dragged through the semi-frozen mud by the news media and people in other states who don’t know the first damn thing about living here. Nevermind. If out-of-staters had any inkling of how tough you really have to be to make it in the Great White North, they’d seldom say a discouraging word about us. By the way, all due respect to Dr. Brewster Higley, who’s credited with the lyrics for “Home on the Range,” but “Where seldom is heard a discouraging word / And the skies are not cloudy all day” is some kinda top-notch, mushy-warm cow pie. Fact is, the temperatures we’ve had around here the past coupla rotations have been dang near Jack London cold; spit and it freezes before it hits the ground. We North Dakotans and Minnesotans are stoic about the whole thing, though (with stoic being a fine synonym for fatalistic). “Cold enough for ya?” is what we ask each other when we pass on the sprint to and from our cars. It’s kind of a joke. But not really. I’m not so sure about that. Seems to me we’ve always had a lot of riffraff in, enough so we shouldn’t be besmirching anyone else’s good name. At least, that’s my view when I look at some of the idiocy coming out of the Legislature in Bismarck and our representatives down in Washington, D.C. Which reminds me – NO, cold weather DOES NOT disprove global warming! Period. Numbskulls. 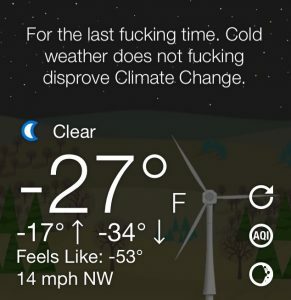 Anyway… about the best you can say is it’s dang cold.